As mentioned in our most recent post, we next traveled to Anchorage. While there, we settled down at the Ship Creek RV Park which is within walking distance to the center of town. It’s a really nice campground, well maintained, and clean but the park has a few shortcomings which we didn’t realize until we arrived. If you plan to visit Anchorage, we highly recommend this park but we do need to provide some warnings. Right on the other side of the fence border lies train tracks. These tracks are used every day. Since there are no railroad barriers and, by law it is mandated that the engineer blow his horn a number of times both approaching and leaving the city, bring your earplugs! As a aside, you get used to it. And, we had two wildlife sightings that could have been disastrous, but were absolutely fine and actually exciting! Calf next to our rig! Moma Moose was huge but I didn’t get her pic! The first day we arrived, Kenny was behind the RV getting it hooked up. Mark and Susan were all set up so they were with me chatting in our rig. Suddenly, I saw a huge moose right in front of our rig. It stopped and looked startled. It had probably been in this park before but not when it was full. She turned around and headed toward the back of our rig where Kenny was! And, behind her is her calf! It all happened so quickly! I didn’t know whether to yell for Kenny to beware or be quiet and hope that all would go well. Honestly, I don’t believe I yelled to Kenny but I did catch a lousy shot of the calf by the side of our rig. As you see, it is through our screen door. Several days later, Kenny and I were in our rig and we heard someone yelling, “Trouble is coming, Trouble is coming!” Kenny thought that someone was calling their dog but I saw a man running for his life past the front of our rig. (For information, you do not run from bears. It is a very, very bad idea.) Luckily, as soon as the bear entered the park she knew this was not the place to be. When she entered, there were several families cooking breakfast outside. People with children were out and about! Moma Bear and her three very young cubs were in the park! But thank God, just like the Moma Moose, Moma Bear corralled her three babies moving them onto the critter path. Once all three were on the path, she stood up (about 7 feet tall) to analyze the situation. According to Kenny, she had the expression of “Do you want to mess with me?” Once she knew no one was following them, she too ran up the critter path. Another dangerous wildlife encounter averted, but what a great story to tell! We never had time to take pictures. It all happened so quickly! It was scary and exciting. We are grateful that all worked out well and that we were able to see wildlife up close and personal. If I have turned you off to this Campground, please forget all I said. We actually went back to the same campground two weeks later to visit Anchorage again and requested the same campground. We could have chosen a different site but we did love that one. Check it out! Very convenient to center of town! And you should almost every single campground we stayed posted warnings about bears or wildlife in the area. While there, we visited Anchorage’s Visitor Center. In fact, you should visit all Visitor Centers! They have information you need to map out what you wish to see and do. And, most have amazing displays, movies, and art work. Most also have great tours of the city. You have to pay, but the drivers have a great deal of folklore to add to the tour. Take the time to chat with the ambassadors of the centers. They hold immeasurable information that can help you get the best out of each city. Outside of Visitor Center – flowers everywhere in town! Loved the moss roof of the Welcome Center! So, of course, we had to hop onto the city tour bus to get the lay of the land. Our bus/tour driver was a local and a teacher during the school year. She was great fun and added colorful information to all we saw. Each Sunday, an open market is held about a block from the center of Anchorage and a short walk from the campground for us. Food trucks offered local fare and local fare was yummy! There were also vendors of all kinds offering anything from shells to souvenirs to live music to amazingly different types of ulus (Alaskan chopping knives). You could even get dressed up and pose with a real sled dog team! These two young boys were amazing and could certainly work the crowd! From Anchorage, we planned a day trip to Prince Williams Sound. With Major Marine Tours, we booked our cruise to Surprise Glacier. We took the ship out of Whittier so the drive from Anchorage to Whittier was as enjoyable as the actual boat trip. To get to Whittier, we had to travel through the Anton Anderson Memorial Tunnel which is the longest highway in North America. Pretty cool to drive through the tunnel! Well actually, Mark drove us through the tunnel but we were all in the car. It has only one way travel so you have to arrive when the tunnel is open for traffic going into Whittier. We saw numerous glaciers and, of course, the stunning Surprise Glacier which was our destination. We also had the pleasure of seeing a bird rookery with thousands of black legged kittiwakes, some sea lions sunbathing on an iceberg, and occasional groups of rafting sea otters. We highly recommend this trip. It featured a Prime Rib and Salmon buffet. Usually buffets on a cruise like this are just okay. Honestly, it was a great buffet! And, they had pretty and tasty drink selections as well! Surprise Glacier – Alas we didn’t see the Glacier calving. When any type of wildlife was encountered, the boat was stopped and passengers were allowed outside on the viewing deck to take pictures. We had brought with us winter coats, hats, and even mittens. Weather turned out to be much warmer than we expected. We only needed a sweater to go outside and take our pictures. Great day! Great pictures! Next we traveled to Homer (different post!) but we had to return to Anchorage the following week (doctor appointment). 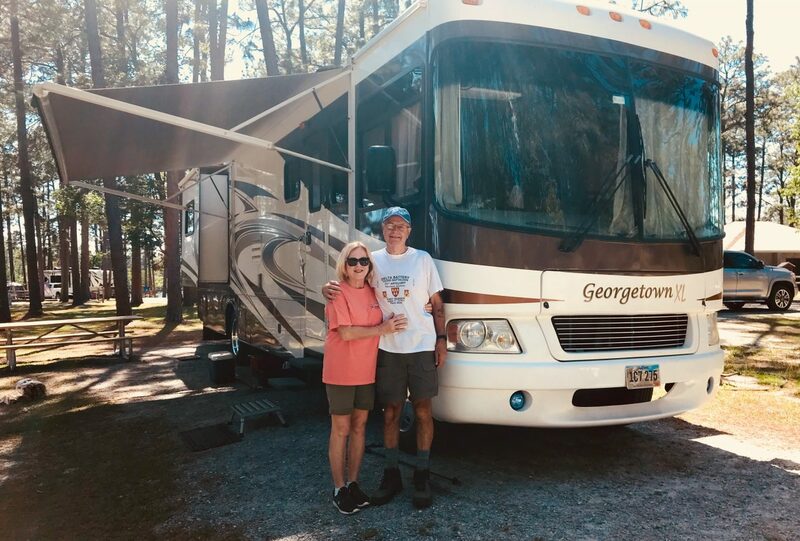 We happily returned to Ship Creek RV Park! On our second trip to Anchorage, we went to the open market again. It was as much fun as the first time. On this visit, we had time to visit the Anchorage Museum. We arrived just minutes before there was a docent-led tour of their latest exhibit which was on loan from the Smithsonian institute. The exhibit is called Living Our Cultures, Sharing Our Heritage: the first peoples of Alaska. What I found most fascinating of all of the information the docent shared (and a great deal of information was shared!) was a party hat. Yup, a party hat which is actually a “Crest Hat”. These hats were worn by high ranking people (mainly in the Haida and Tlingit first people tribes.) All members would strive to attain wealth. Once achieved, the person would throw a huge party called a potlatch which is an opulent ceremonial feast. The wealthy person invited all of his family, friends, neighbors, acquaintances, even people he didn’t like. It is a gift giving feast. At the potlatch, the host would give away his material wealth, leaving himself poor. He would acquire more material wealth when he was invited to another member’s potlatch. Those who had previously attended his feast would attempt to surpass the gift that they had received from him. Basic hat would have had the first “crown”. The woven cylinder topping the crown, is called a skil, and each skil represents how many potlatches one has hosted. This hat with the three skils designates that the wearer of this hat accumulated wealth three times in his life and gave his wealth away three times. Wait. What? Why? To me, wearing this hat would be showing off their wealth regardless of the fact that you now poor. But, I did find that little tidbit to be very interesting. That was only one exhibit! You could easily spend days or a week there. In each area, there were numerous touch screens where one can zoom in on different objects and obtain more information. I do have to mention that The Cruisin’ the Fossil Coastline was also very cool! We are certain that whenever you are in Anchorage the Museum would always have amazing exhibits! This Museum is AWESOME! Kenny and Debbie! So cool. We are sitting on our porch in Owls Head Maine reading you Alaska blog. Outstanding. We want to go. We’ve got our van up here and are headed to New Brunswick in the next couple of weeks-there’s a boat builder I want to meet. I reread your letter of last April. Are you still planning to be in New Brunswick in Sept? Let’s meet somewhere. We are heading to New Brunswick September 6th or 7th to visit friends in St. George. We are passing thru CT on our way up. If you got my letter, you have my number, give us a call to see if we can meet! Good to hear from you. Going Out Hawaiian Style – Happy 2019! Sour Toe Cocktails, Cancan Dancers, oh My!